This article first appeared in haven,The Edge Malaysia, on Issue #76 December 2015 + January 2016. THE year-end festive season is upon us again. Where did the time go? The year has flown by so swiftly that it is hard to believe we are about to usher in another. That said, the avid host is surely preparing the home for a round of merriment — the silver needs to be polished and the best table linen aired. A list of guests, both naughty and nice, must be drawn up and the menu carefully crafted. The main stage of your great Christmas or New Year’s production is the table, the heart of the feast, where you will gather together with your loved ones and celebrate yet another year well lived. There is a single rule that we at haven always adhere to — your home isn’t party ready if the table isn’t set. And don’t we all love a beautifully dressed table, from the finer details of the place settings to the flower arrangements and candelabras to enhance the mood. These days, table settings have become a little more creative, especially with the growing popularity of DIY and craft projects among the house proud. 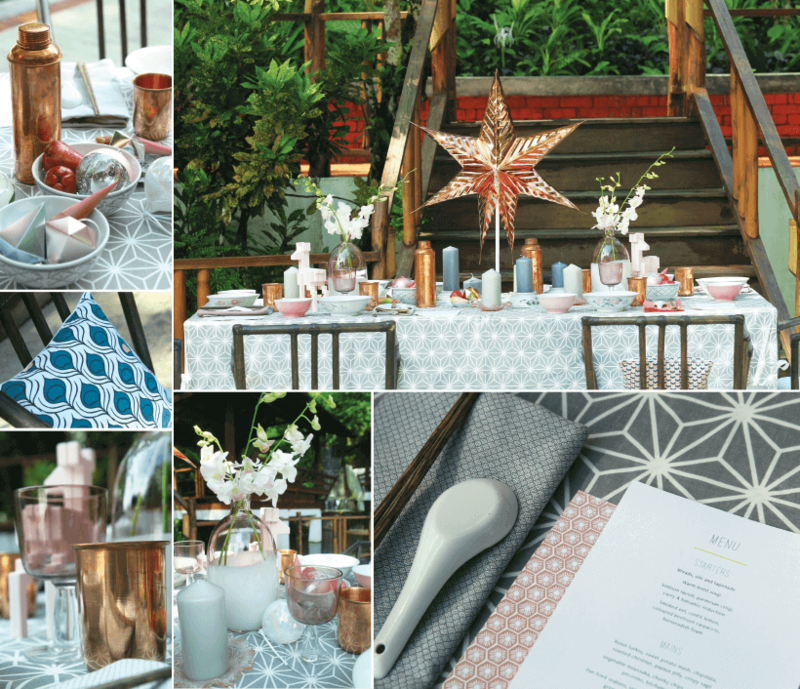 And that is why for the third year in a row, we hooked up with Lisette Scheers, founder of creative agency L.Inc and lifestyle brand Nala, to come up with a series of festive tablescapes that you can try out at home. For the humble dining table, no occasion is too small for a chic arrangement. The pleasure of a beautifully set table is always reflected in the delighted guest who appreciates it when the host goes the extra mile to make the event ever more special. This year, the inspiration behind our trio of tablescapes is our rich heritage and diverse cultures. Ethnic elegance is our way of celebrating the beauty of Malaysia. 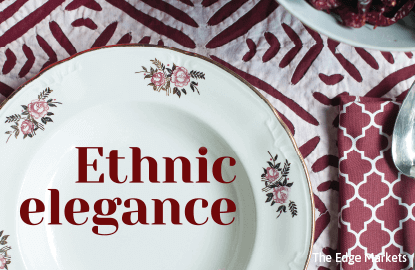 We stayed away from kitschy Malaysiana and opted for a more subtle and sophisticated interpretation, mixing heirloom china with contemporary elements that are easily available from IKEA. Serving as the perfect backdrop to our concept was Tamarind Springs Restaurant in Ampang, the gorgeous, rustic dining experience nestled amid the jungle. “How I usually come up with a theme for the table is first, look at what is in my cupboard … I buy continuously so I have an incredible amount of stuff. I always start with the colour, and then I get into the right-brain mode and look at everything everywhere,” says Scheers. Each setting is a hotchpotch of ethnic references. Much like our kaleidoscopic heritage, we take the best of what we have in the cupboard, even stuff we inherited from grandma, and piece them together to form chic and contemporary tables based on colour schemes. Each table has no less than three cultures. From red hot chilli to a tropical blue-green combination, these tables are sure to deliver that “wow” effect at your next party. And with a wink and a smile, it’s time to get into the holiday mood. Check out our vivid spread of beautiful tables with the right touches of quirk and elegance. We hope it will inspire your next dinner party. Food is certainly the tie that binds Malaysians, and it takes an artful eye to make the following observation — there are so many soft pinks in Asian food. With that, it only made sense to build on a palette of pink with a soft stony grey. Grey and light pastel pink are not traditional Asian colours but make picture perfect bedmates in this setting that delivers oriental elements with a Swedish touch. Table linen, napkins and cushion covers with prints that remind us of our old Peranakan grills set the tone. Vintage Chinese plates and bowls, chopsticks and spoons sit comfortably alongside metal pink sculptures of reindeer and copper jugs and cups. In place of traditional floral arrangements are delicate local pink orchids, bunga kantan and jambu air, matched with luminescent white baubles, a mix of grey and white candles and metallic paper cubes. The centrepiece is a gorgeous copper star that adds shimmer and sparkle. FROM IKEA MALAYSIA: DOFTRIK quilt cover used as tablecloth (RM79); SITTNING napkin (RM9.90); SITTNING tea towels (RM19.90); SAMSPELT metal deer decoration (RM69 each); FORMLIG vase (RM69 each); SITTNING wine glass (RM29.90 for two); VINTER 2015 unscented block candles (RM26.90 for a set of five); HEMSJÖ unscented block candles (RM6.50 for four); VINTER 2015 glass bauble (RM44.90 for two); VINTER 2015 metallic paper cube hanging decoration (RM17.90 for five pieces); VINTER 2015 mini baubles (RM8.90 for 12 pieces); STRÅLA star table lamp (RM39.90). This table is about making raw and rustic pop with contemporary cool. It encourages you to bring your pots and pans to the table. Hey, if you’ve splurged on designer crockery, this is the perfect time to show them off. “I love, love the table filled with all the pots and pans — it’s how they do it in the countryside in Europe, and we hardly see it here,” says Scheers. The scheme draws inspiration from tropical greens, jazzed up here and there with blue and charcoal elements. Indian metal plates and bowls are matched with smoky tinted goblets. Reversible green and purple napkins liven up each place setting. 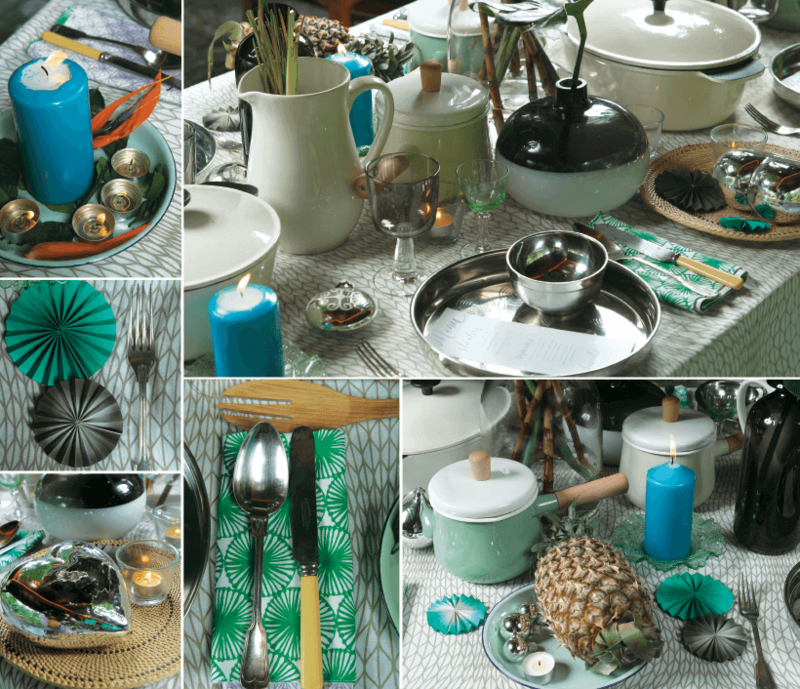 Vintage green metal dishes are used in a quirky decoration comprising tea lights, block candles, and whole pineapples. Stalks of bird of paradise are matched with large palm fronds. FROM IKEA MALAYSIA: SENIOR casserole with lid (RM159 and RM199); KASTRULL saucepan (RM49.90 each); GRADDAG jug 2L (RM5.90 each); STOCKHOLM salad servers (RM29.90); ATGANG vase (RM34.90); KRYDDIG spice mill (RM45.90); FARGTON gift-wrap decoration (RM11.90 for set of six); FARGTON large decoration (RM15.90 to RM29.90). Fiery passion, good fortune, romance, spice — a red table is always deliciously delightful and spells celebration in the loudest way possible. Red and white make a lively pair here starting with a beautiful hand-stitched table cloth from India. Vintage china and ceramic plates give the setting a classic touch, but the twist here is cheeky — bowlfuls of dried chilli and bunga kantan as décor, sitting vibrantly with glittery metallic red candle stands and crimson paper Christmas trees. A clever touch is the retro red flask in the centre that is used as a vase here, holding palm fronds, elegantly matched with stems of red anthurium. Look closer and you’ll find charming metal birds perched in them. FROM IKEA MALAYSIA: SKIMMER block candle holder and candlestick (RM44.90 and RM39.90); JUBLA unscented candles (RM29.90); HEMSJÖ unscented block candles (RM6.50 for four); VISIONAR paper decoration (RM35.90); DOFTRIK napkins (RM25.90 for a set of four).